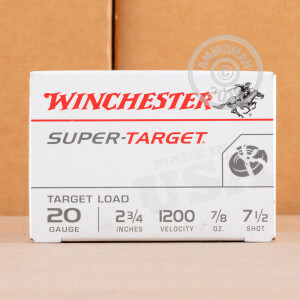 This economical "white box" 20 gauge target load from Winchester is a great choice for target and trap shooting thanks to its good patterning and mild recoil. Each 2-3/4" shell in this case of 250 fires a 7/8 oz payload of #7.5 lead shot at a muzzle velocity of 1,200 feet per second. 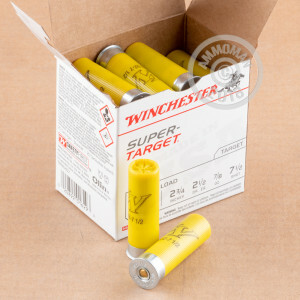 These shells feature a one piece hinged wad and reliable primers for better accuracy. 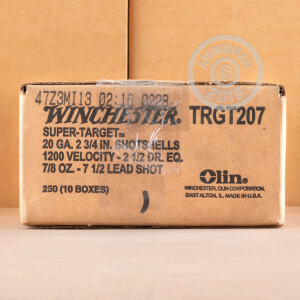 Like other Winchester ammo, they are made in the USA.